This was an excellent question, as it made me delve into the distinct details that set these dreams apart from a regular dream or a lucid dream. I’m not sure I’ve ever had a lucid dream, but in my regular dreams, the setting always seems to be present day and I’m usually myself in my dreams. I rarely see myself in my regular dreams. Most of the time, I see everything from my own eyes. The other people in my regular dreams are usually people I know or representative of people I know. Even if there is someone in my dream I don’t know, or don’t recognize to represent someone I know, I am at least still me in the dream. The other thing I notice about my regular dreams is that none of them really make sense, or something totally whacky happens when they are making sense to make them suddenly…yeah…NOT make sense. The sequencing is odd, too. My regular dreams roll a lot like those Old Spice commercials: I’m in the club dancing like a fool, and then I’m on the golf course teeing off, and then I’m floating down a canal on a gondola – look up, look down—I’m on a horse. And it’s all the same day. Oh, and there are gargantuan snakes dropping from the tree branches when I’m hanging out in the woods with my friends. I’m not even kidding. I sometimes wake up wondering if I smoked crack before I went to bed. Past-life regression dreams are way different. For starters, I don’t recognize anyone in the dream, but yet I feel very connected to them. Every single past-life dream I’ve experienced has taken place in a different time period. The first one I had took place in the 1930s or 40s. I could tell by the clothing people wore, the cars they drove, and the appliances and décor in the homes. Everything was so retro. My second past-life dream took place during World War I. The most recent one I had took place so long ago, I can’t even tell you what time period it was; all I know is that the transportation was horse and wagon. No, not even a buggy; just a rudimentary wooden wagon. The accents of the people in this most recent past-life regression dream sounded quite Gaelic. I’m not sure where they were from, exactly, but when I visited Scotland.org on a hunch, I saw photos there of historical stone homes that looked a lot like those in my dream. The dark waters in which the people in my dream played reminded me of the very lochs in which the “Lochness Monster” had been allegedly sighted. One of the men in the dream even mentioned “Nessy” when an unidentified water creature bit the big toe of the matronly strawberry-blonde woman in my dream. My past-life regression dreams play out in chronological order, just like most well-told stories. The time-period and setting details are exquisite. And, even though the people are not anyone I recognize from this life, there is always a familiarity—a connection—and I can usually identify which person in the dream is who I was in that past life. I also tend to remember every last detail of my past-life regression dreams as if they really happened, whereas, in my regular “Old Spice” dreams, I only remember bits and pieces. The things that amaze me most about my past-life regression dreams are mostly the historical details. The clothing. The transportation. The landscape. The architecture. And even the accents! I mean, I’m no historian, so I really don’t know what these things looked like in the past, except for what I’ve seen in movies and on television. I’m also no traveler, so I’ve never been to Scotland, and I don’t know the Highlands from the…Lowlands? I really have no clue. I don’t even know anyone from Scotland. The only Scottish accents I’ve ever heard are that late-night talk-show host and bad imitations on movies. It’s odd, though. Just a few weeks ago when I was walking the Lake Michigan shoreline, I thought I’d heard bagpipes playing in the distance, and I suddenly felt comforted, the way a care package delivered to summer camp seemed to cure homesickness back in the day. The strangest thing is that I’ve never even considered the sound of bagpipes musical until that moment. As I climbed the dune to the parking lot that evening, I discovered it was, indeed, an older gentleman playing “Amazing Grace” on the pipes. Mystery solved. But the greater mystery was why I felt soothed by the sound. Now that I know I have ties to Scotland, I guess that may be the very reason why. 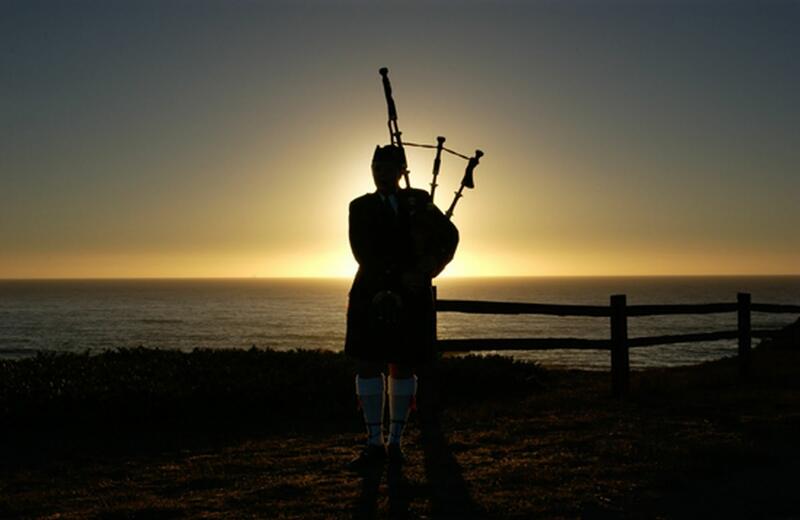 Perhaps it was the bagpipes on the beach that inspired this deep connection to this particular past life to reveal itself in my dreams. There’s a link between each and everything you’ve ever done and where you are now. It’s all contributed to making the present the best possible place to be. In other words, do take time to thank all of your former incarnations, both in this life and in others. Hmm. Bagpipes on the beach. Who knew? ← Welcome to FreerSpirit Akashic Readings.